This is the opening afternoon of the new season of ‘Uptown Hackney’s’ Posh Club, a loud, energetic, joyous romp of an afternoon tea, held in the sumptuously decked-out church hall of St Paul’s West Hackney in Stoke Newington. Now in its second run, the weekly tea dance has become a sell-out event, attracting senior citizens from across the borough and beyond. Dress code is strict: dig out your finest – but don’t expect anything demure. While tinkling ivories accompany the immaculately laid-out afternoon tea, and energetic waiters in retro uniforms (all volunteers) perform a scrupulous service, it’s not long before the champagne flows, the disco tunes kick in and the – often raucous – turns begin. Acrobats, performance poets, tap dancers, hula-hoopers, Elvises of many extractions – they’ve all graced the stage here – and literally anything goes. Posh Club has glamour, spirit and utter joie de vivre. And Posh Clubbers love it, expressing their delight in dressing up, getting together and giving their sequins a shimmy. As one woman told us: “I’m not sure I’ve ever heard of anything so nice for £4”. Among the regular attendees is Irene. 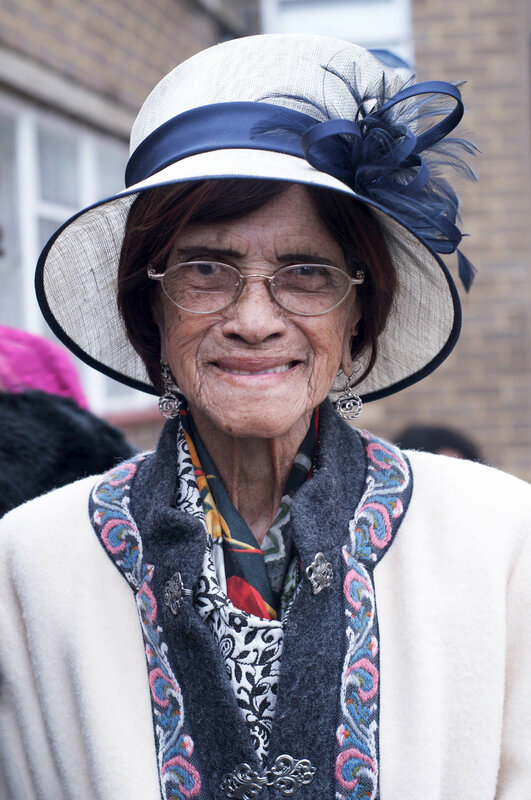 Originally from Guyana and a Stoke Newington resident for 40 years, she’s a superbly turned out and rather sprightly 107-year-old – and a huge fan of the event. Funded this season by West Hackney Parochial and Hackney Council, the club is just one of the many events hosted by Duckie, a performance and events collective, founded by Casson, who grew up in Hackney. Running every Wednesday until the 24th February, the line-up is suitably outrageous, and the perfect way to stave off the winter blues. If this is old Hackney meeting new Hackney, it looks like they’re getting on famously. Clockwise from top left: Posh Club founder Simon, and Krishna; Irene, the Posh Club’s oldest (and loveliest) regular, at 107 years; Art the pianist, taking a break from tinkling the ivories most beautifully; Doreen’s vital statistics - 3 husbands, 70 years in the same house, 1 fabulous head of self cut and dyed pink hair.